Unsure of what gift to buy family members, friends or co-workers? Need to honor that special occasion: anniversary, holiday, graduation, or wedding? Has someone recently passed from this life? We have a perfect gift for the animal lovers in your life. Give a gift to the Remember Fund on their behalf, which in turn, will benefit the shelter animals at HSCC. The recipient will be given a beautiful angel card, acknowledging your gift and the joy of knowing they have brought comfort to a homeless animal in our community. Place your order below and include the details (names and addresses of the recipient) to be written in the card. There is a minimum donation of $25. You may enter a higher donation if you wish. Thank you. In 2003, two friends and Humane Society of Catawba County supporters decided to collaborate on a program that would benefit the organization and the homeless animals in their care. Locally renowned artist, Vae Hamilton, and her friend, Sandra Clay put paint brushes and ideas together and came up with the Remember Fund, a unique way to remember, celebrate or honor a person or event in someone’s life. 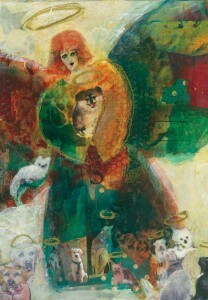 Vae created a stunning, colorful image of an angel surrounded by furry and feathered friends that was used to create beautiful note cards for HSCC to distribute. Sandra’s contribution was the passion to help HSCC encourage people to contribute with a donation to honor and celebrate special occasions. Sandra and husband, George Clay III, underwrote the program in loving memory of three badly burned young kittens that were left at their back door on July 4 many years prior. Pavarotti, Tuffatore and Orrichio went on to live wonderful lives under the care of the Clays. The Remember Fund continues to be very successful, and HSCC recently appreciated a second angel design from Vae Hamilton.